I don't want to start with a cliche about how expensive college is getting, but yeah. It's expensive. And with all of this bloated administration and wasted resources, college doesn't seem to be getting any cheaper. So are we really getting what we're paying for? Let me explain how payment works at USC for a semester: you pay a lump sum of $24,732 for the option of picking between 12-18 units. This equals to about 4-6 classes. That equals to a minimum $3,000 a class and a maximum of over $8,000 for a single 4-unit class. That's an insane proposition when thought about in terms of a purely "per-class" point-of-view. Do you really think that learning about Korean history was worth, say, an average of $5,000 and a half-year of your time? No foul against the Koreans, but I want to really put it into perspective how much we pay for college. I can't imagine people are shelling out $5,000 per class for the "education". The ultimate goal is that degree. And what is that degree supposed to provide? Job security. It's arguable whether or not a bachelor's degree really does provide job security, but look at how we interpret the experience of getting that degree. For instance, when people say that we're "depriving someone of an education," that's not really what they mean. Depriving someone of an education in our culture means to deprive them of a degree, which is presumed to be the item that acts as the bridge from lower to middle class. And whoever is willing to bite that bullet and go for that degree is paying $5,000 x 6 classes in terms of required General Education units. $30,000 on broad classes that are simply supposed to "enlighten" you. But let's imagine what you could do with just the money saved from just one of those classes. Only $5,000. What if instead of spending $5,000 to sit in a lecture hall and talk about Korean history, you took a different route. You actually wanted to experience Korean history, not just read about it in a textbook and talk about it with a bunch of white people during Discussion section. I understand that some people may consider it radical to actually experience culture over paying five grand to read about it, but here goes. The Night Market is filled with food, activities, and art in Seoul, Korea. $120: purchase numerous books, autobiographies, and movies on Korean literature, language, and history. 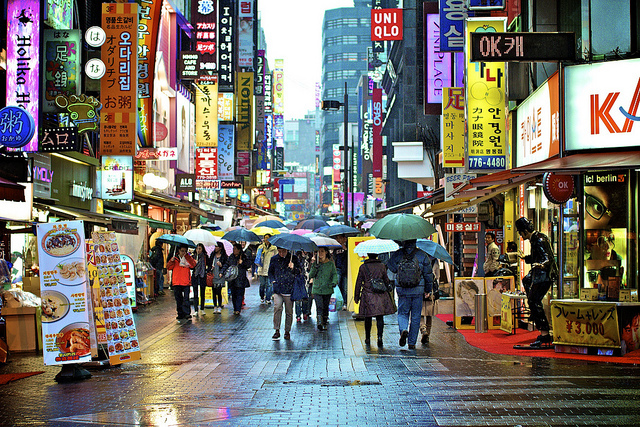 $880: round trip from LAX to Seoul, South Korea. $400: Travel VISA and other legal documents, boring stuff, etc. And all of this totals up to $5,000. For the same amount of money of one Korean History college class, you could instead spend it on this immersive 2 month trip to Korea, exploring the sights, interacting with the local communities, and experiencing the culture through art, food, and music. Which one would you choose? The 4 month class, or the 2-month experience? The point of this discussion is not to say that all of the resources college provides you with are worthless. The point of this is to keep us all conscious of the true definition of "education" and realize the alternatives other than college we can take to acquire it. What if instead of taking these $5,000 dollar classes and just talking about opening up our minds for a semester, we instead used that money to travel abroad and immerse ourselves in a different culture. I reckon that would be way more cost effective for colleges to promote diversity and broad thinking skills rather than forcing General Education courses down our throats.